Paid social media is anything that is influenced by advertising dollars spent. Any post in your news feed that has the “Sponsored” tag is paid social media. If you then “like” that post, that is considered a paid reaction. Paid social media includes boosted posts, ads optimized for clicks, lead generation forms, video ads, among other objectives, and can be targeted by a variety of demographic and behavioral factors. Many page owners think that organic reach (the number of unique individuals who see your post pop up in their news feeds) is enough to make an impact. This was true in the first few years of Facebook but is no longer the case. Facebook, and many other social media networks is truly a pay-to-play network. Facebook, Twitter, Instagram, and LinkedIn are all on algorithmic feeds, meaning posts are shown to the user based on past behavior and preferences instead of in chronological order. Organic posts from your Facebook page only reach about 2% of your followers, and that number is dropping. Facebook recently announced that, in order to correct a past metrics error, it is changing the way it reports viewable impressions, and organic reach will be 20% lower on average when this change takes effect. For example, as of this writing, cleveland.com’s Facebook page has 480,591 likes. A post about the impending snow storm has been live for 24 hours and reached 8,124 individuals—1.7% of cleveland.com’s followers. 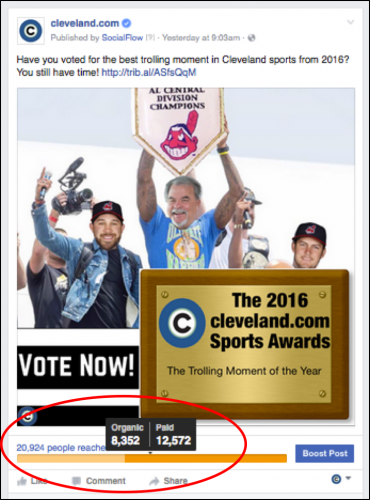 In contrast, a post about the cleveland.com Sports Awards had paid promotion behind it and reached an additional 12,572 people on top of the 8,352 people the post reached organically. 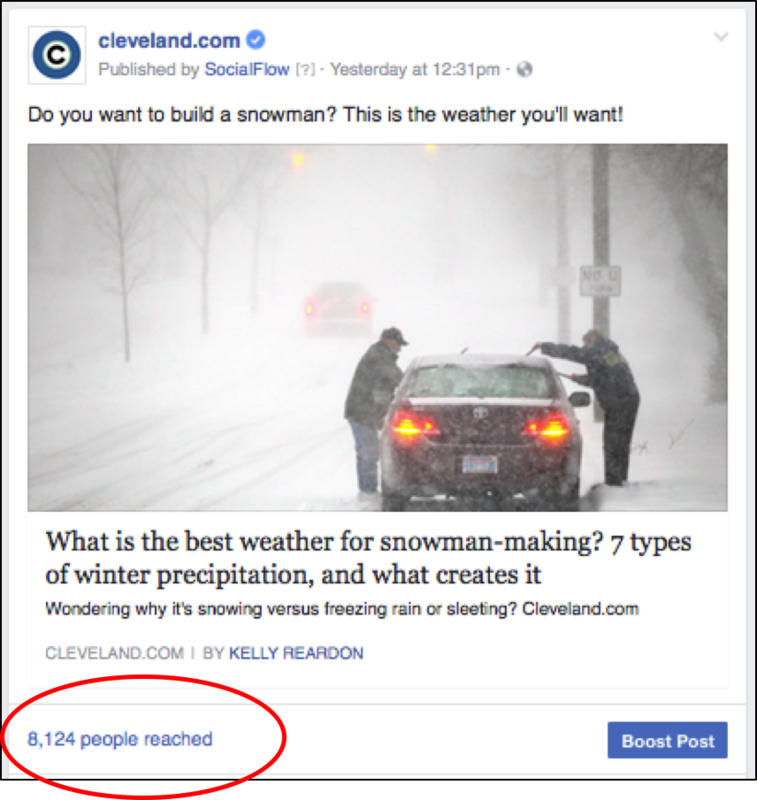 The additional 12,572 people reached aren’t necessarily fans of the cleveland.com page—the paid promotion was targeted to anyone in the Cleveland area who is a sports fan, extending our reach beyond those who choose to like the page. With stats like that, you’re probably wondering why you should even bother with organic posts. Although organic reach is low, it’s still important to have an active, consistent presence on social media. Your Facebook page, Instagram account, Twitter profile, etc. are often where people turn to for updates from your company or to ask questions. Low organic reach doesn’t mean you should stop posting organically all together—it means you should focus more of your efforts on a paid social media strategy while maintaining a solid organic strategy. 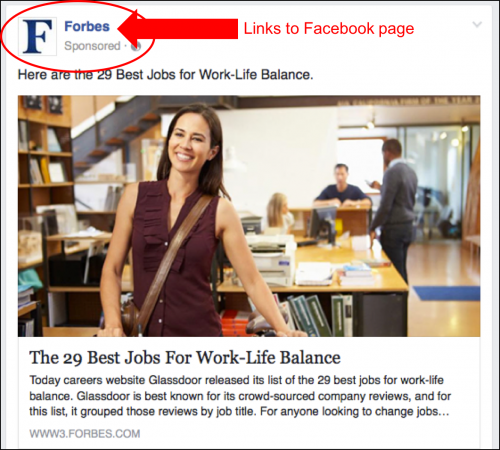 Facebook ads contain links back to your business’s page. Even if the goal of your ads is to get people to click on a link that takes them off of Facebook, there’s a chance they’ll go directly to your Facebook page to learn more about you. If your page is empty or outdated, that’s where their curiosity ends. If you’re spending the time and money to advertise on Facebook, make sure you follow through with an up-to-date Facebook page. Organic and paid social media—you shouldn’t have one without the other. A solid organic strategy improves your online presence and reputation, and a paid strategy increases your brand’s reach and awareness to targeted audiences. Managing both aspects of social media takes time and planning, but the results of a well-executed campaign are worth the effort. No time to handle it on your own? We’ve got you covered.